Tokyo Ghoul is a dark horror/fantasy series based around the idea of ghouls that live in Tokyo and feed on humans. Our story follows young Kaneki who encounters a young girl at a local café who likes all the same books as him, but after a brief date Kaneki quickly discovers that this girl, Rize, isn’t all she seems and is in fact a ghoul! Matters are made worse when the two are involved in an accident leaving Rize dead and Kaneki in need of an organ transplant which leaves him alive but with the organs of a ghoul, meaning his body slowly changes and he becomes half-human half-ghoul. The events of that day mean Kaneki doesn’t really know where he belongs anymore as he doesn’t want to eat humans to survive in the ghoul world and can no longer really fit in the human world with his hunger for human meat. The first volume of Tokyo Ghoul is less world building and more geared towards dealing with Kaneki’s stance on the world as he now is which throws up some interesting insights to Kaneki’s thinking which will probably lead for a stronger story as we go as quite frankly, what and where these ghouls come from is not something we really need to know quite yet. Beyond Kaneki the series has so far done a good job of establishing a number of different characters, both friendly and those not so friendly. One major character of note is Kaneki’s childhood friend Hide who isn’t a massive player in the series at the moment but there is definitely room for him to become quite important, especially after events closer to the end of the book. The first volume also does its best to introduce both good and bad ghouls, the former of which Kaneki ultimately seems to end up with, but the bad ghouls seem to be very interesting characters in their own right and it’ll certainly be nice to learn more about them as the story goes. 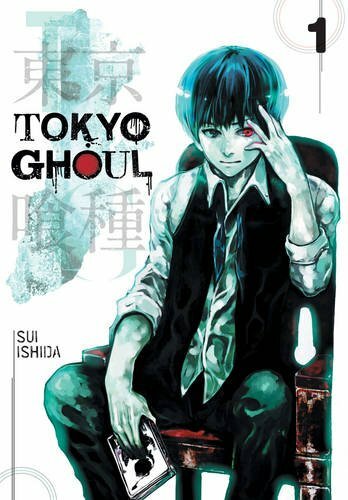 Viz Media are printing Tokyo Ghoul under their Viz Signature lean which is ultimately the right choice for the series. Being under this imprint means that the books for the series are larger than the standard manga size that Viz normally put out, the size for the Signature line puts them closer to that of a light novel. Considering how detailed the pages of Tokyo Ghoul are it really benefits from having the bigger pages, especially in battle scenes when things become a little hectic. The artwork for Tokyo Ghoul is an interesting style choice that I actually really like as Kaneki and the characters around him aren’t drawn as tough characters like maybe you’d expect out of a horror/fantasy series like this, no they’re actually fairly cute and not something I expected to see. However whenever we are viewing scenes with ghouls the character designs do change to something a bit more heavy and what you’d expect from the series which I appreciate as it means Tokyo Ghoul really can handle wherever the story is going. Fight scenes are incredibly well detailed and I never felt lost as to what was going on, backgrounds and characters are too really well detailed which adds to the feeling of a story you can truly get lost in. I went into Tokyo Ghoul having a real liking for the series and came away simply with a certain admiration for it. The series still has a lot of its world to build but having the first volume focus on characters and Kaneki fight over his human and ghoul views is done extremely well and I’ve finished the volume eagerly awaiting more. Roll on volume 2!